The most decorated British Paralympian has spoken of his frustration at, what he believes, is a lack of recognition for his achievements. 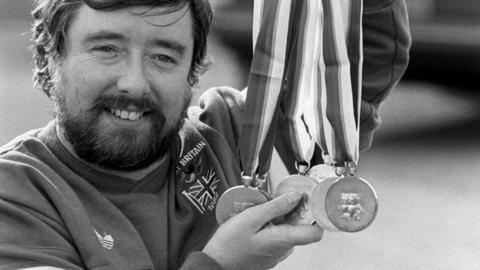 Mike Kenny won 16 gold and two silver medals across four Paralympic Games with his last victory coming in 1988. "Everyone says 'you've been airbrushed out and nobody knows who you are'," said the retired swimmer, now 67. "If you have the most gold medals, surely there's a slot for you to be fitted in?" Kenny has won more medals than 11-times gold medallist wheelchair racer Baroness Grey-Thompson but will not even get to the Games as he cannot afford the trip from his Greater Manchester home. He told BBC 5 live sports extra: "Other people say 'you should be Sir Mike Kenny'. That's not to do with me - that's up to the powers that be. "A lot of people have asked why I could not present a medal to someone. I was invited to light the flame at Stoke Mandeville but could not afford the round trip. "I look today and I'm amazed at the facilities they've got - it's marvellous what has happened to the Paralympics over the years. They're the best thing since sliced bread. I think the funding makes it now. "We did not have physios or trainers. My wife stood at the poolside and clicked the clock - that was my trainer."